This garage-style kitchen cupboard is for your small appliances when they are not in use. It is ideal for gadgets such as coffee machines, blenders or steamers – anything you don’t use everyday and want to keep out of view. Usually made of wood, a butcher’s block is a thick, solid section of your work surface that makes the perfect place to chop your food. Computer Aided Design, or CAD, is the software kitchen fitters use to create 3D images of what your kitchen could look like with all your desired features. It is useful to help you see what can fit where and ensure you have room for it all. 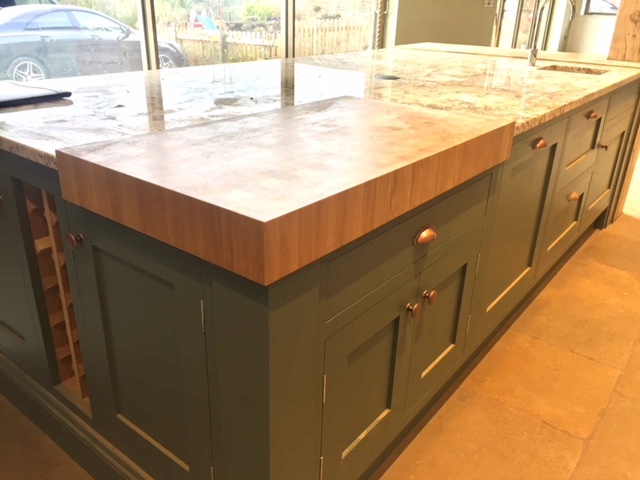 These worktops are made of a blend of materials, intended to make for a product that is stronger, more durable and usually cheaper. They usually involve some sort of MDF material and laminate and have a matt finish for a modern look. In order to create a sleek, clean look on the outside of your cabinets, concealed hinges are placed in the inside, hidden from view but just as functional as you’d expect. 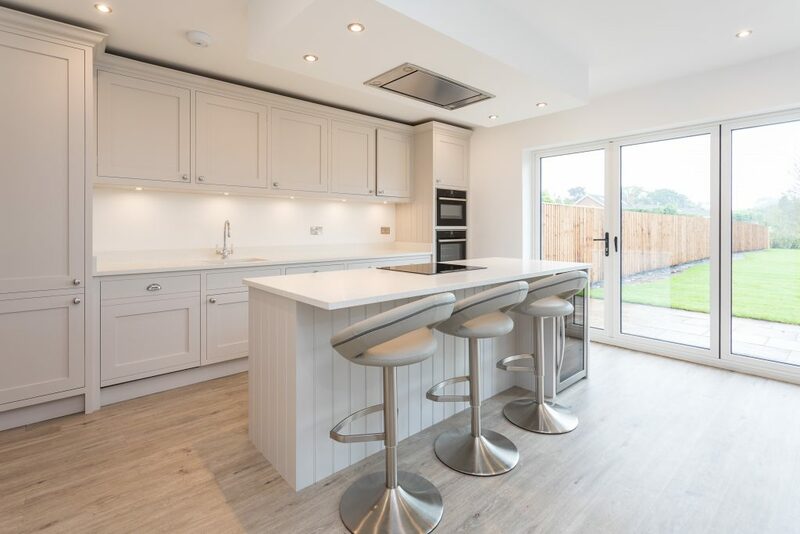 Traditional kitchens almost always feature a cornice – a decorative panel or trim at the top of kitchen cupboards on the walls, giving the room an enclosed and ‘finished’ feeling. A cornice eliminates that empty space at the top of your cupboards. We need to make space for features such as sinks or your chosen integrated appliances. The holes we create to fit these in are called cut outs. Many people like the convenience of an electric oven but the safety aspect of a gas hob. A duel fuel cooker combines the two, so that you get the best of both worlds when making dinner. The side of a cabinet that isn’t obscured by a wall is enclosed with an end panel. These are given the same style as the doors but are purely to keep the final design looking tidy and attractive. This term refers to kitchens with parallel cabinets and worktops along opposite walls, creating a long walkway in the room. They are often used in smaller kitchens in order to maximise space. Ensure your most decorative kitchen implements are always on display with glazed doors on your kitchen cabinets. These doors are made with a glass panel, so that you can see everything that is inside the cabinet. Catching your clothes on annoying handles is a thing of the past with handleless cabinets and cupboards. These include both push-catch doors, which require a little nudge to release them from a magnet, as well as doors with integrated handles carved out of the door itself. Integrated appliances give your kitchen a tidier finish, hiding popular kitchen white goods such as dishwashers, refrigerators and washing machines behind a unit door that matches the rest of your new kitchen design. Larger kitchens can benefit from an extra kitchen unit in the centre of the room, known as a kitchen island. These can simply provide extra counter space, or they can accommodate a sink, an oven or any other appliance that you need in your kitchen. When kitchen designers are putting their plans together, they work according to the kitchen work triangle. This is the distance between the three most important appliances: the cooker, the sink and the refrigerator. Keeping these equidistant (or as close as possible to it) makes for a more harmonious working space. Read more about the kitchen work triangle in this blog post. A storage space for perishable goods such as eggs, cheese, fruit and salad, the larder is kept cool to keep them fresher for longer. They tend to use cold materials such as slate or marble rather than electric to keep them cool. A pantry is a tall cupboard used for non-perishable goods such as cereals, pasta, tins and baking essentials. An essential feature in traditional kitchens, they are starting to come back in favour more recently. Similar to a cornice, the pelmet is another aesthetic finish that is used for wall units. Unlike a cornice, however, it is placed at the base of the unit, making for a smoother and neater transition to your kitchen surfaces. Similar to a kitchen island, a peninsula is attached to the existing kitchen area, so that it creates a u-shaped design. It is popular in dual purpose rooms, helping to block the kitchen off from other living areas while providing any necessary extra counter space or storage areas. With no structural purpose, a pilaster is a traditional, decorative column, often used on kitchen island corners or at the end of a row of cabinets. This refers to the wood placed at the base of the floor units to hide the legs and empty space underneath. It gives the kitchen a ‘finished’ aesthetic. This simple but stylish kitchen door design is made up of a single centre panel surrounded by four separate wooden lengths to create a square frame. Put an end to the unnecessary noise that comes from slamming kitchen doors with soft close hinges. These hinges ensure that no matter how hard you try to shut a door or drawer, it will close slowly, softly and quietly. Intended to shield your walls from cooking spills and splashes, the splashback is the feature placed behind your hob. Usually made to match the kitchen countertops, this metal or tile panel reaches up to the extractor fans for maximum protection. Some food, especially fish and vegetables, just tastes better when steamed. A steam oven offers a healthier way to cook your food, heating a water reservoir to create steam that will cook your food, leaving it juicy and richer in vitamins and minerals. Now that you understand the jargon, picking your new kitchen features should be much easier! Get in touch with us today so we can help make your dream of having a luxury kitchen a reality.